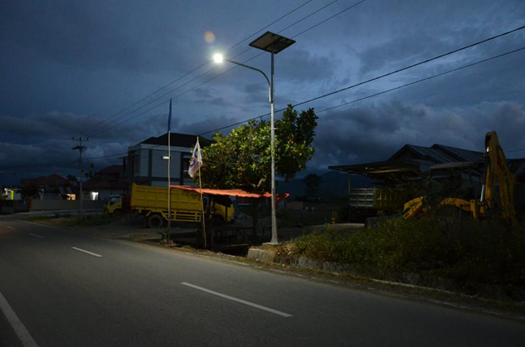 KERINCI - The Government through the Directorate General of New Energy, Renewable and Energy Conservation (DG EBTKE) of the Ministry of Energy and Mineral Resources (ESDM) has completed construction of 67 Public Street Lighting – Solar Power (PJU-TS) in Jambi Province for 2018. Infrastructure This was symbolically handed over by the ESDM Ministry's Inspector General, Akhmad Syakhroza, who was present last week (Saturday, 13/4) in Kerinci District, Jambi Province. "In 2018, the Ministry of Energy and Mineral Resources through the Directorate General of EBTKE carried out the installation of PJU-TS in 26 Provinces and 166 Regencies / Cities with 21,839 units of installed PJU-TS. For Jambi Province, PJU-TS units were built in 67 points and all were built in the Regency Kerinci, "said Syakhroza. He further explained that PJU-TS is a public street lighting lamp that uses sunlight as a source of electrical energy and is integrated with batteries. This PJU-TS is very suitable for streets in unreached areas PLN electricity and also areas that experience a crisis of electricity energy, especially in remote areas. PJU-TS can be applied in urban areas such as in the main roads, residential areas, industrial estates and other public facilities. Syakhroza revealed that the PJU-TS does not depend on PLN's network and transmission. Therefore if the PLN faces obstacles, such as natural disasters or fallen trees does not affect lighting in the surrounding communities illuminated by PJU-TS. "By using PJU-TS, it can also save expenses from the Regional Government and PLN as much as 100%, so that the costs can be allocated to other regional development," said Syakhroza. 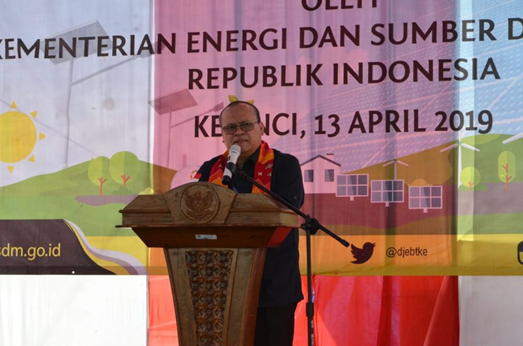 On the same occasion, the Head of Kerinci District, Adi Rozal, revealed that the PJU-TS program was very felt and beneficial for the people in the area, especially when there was a power outage at night. "The program was very beneficial for the community, yesterday electricity had been extinguished for five days, with the PJU-TS on the road still bright and the community felt comfortable at the time go to the mosque at night for prayer service," said Regent Adi. He also expressed his hope that the Central Government, in this case the Ministry of Energy and Mineral Resources could add the program so that people in rural areas can feel public street lighting. 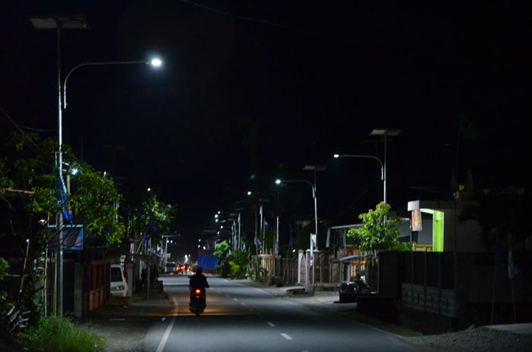 With the construction of the PJU-TS, the Kerinci regency can save the regional budget because it reduces costs for public street lighting.